At the beginning of 2017, Congressional leaders began the process of repealing Obamacare. The stakes were real and high: With repeal, 30 million people would lose their health insurance, premiums and taxes would increase, and states would lose critical funding for Medicaid. In response, Organizing for Action launched a petition to demonstrate to congressional leaders the grassroots energy organized against repeal, and to fund the fight ahead. To turn organic energy into petition signatures and donations, the 270 ads team developed a Facebook advertising program designed to reach and activate the people likeliest to take action. 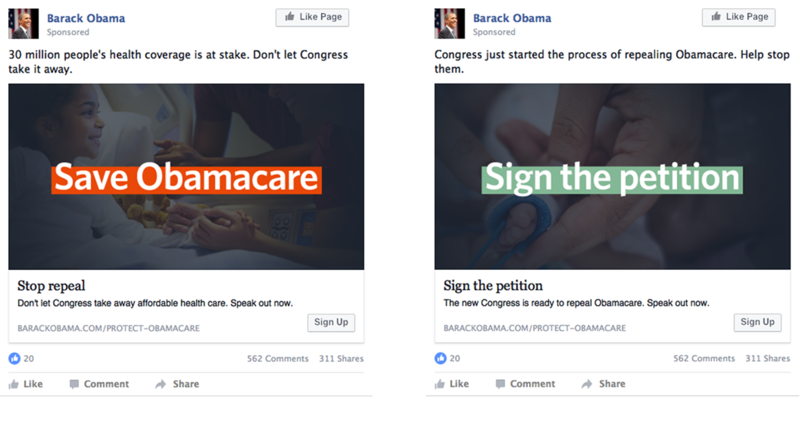 We targeted various segments of OFA’s existing supporters, and built additional audiences using lookalike modeling and behavioral interest targeting to expand our reach. 270 built a daily reporting dashboard demonstrating OFA’s precise return on its investment. Every single morning the OFA team had a clear, concise report in their inbox measuring key ads campaign performance metrics. Detailed, regular reporting allowed us to be nimble: We shifted budget to top-performing audiences and surfaced trends in creative performance that enabled us to pinpoint the exact images and copy that appealed most to each of our target audiences. The program proved profitable all along the way: For every dollar they spent on ads, they immediately raised $1.87 right back. But most importantly, in addition to 18,000 donations, we helped nearly 700,000 Americans raise their voices by signing OFA’s petition in defense of Obamacare.